Lace up your walking shoes. Tune up your bicycle. Ditch your keys. Today is World Car Free Day. The global event to reclaim streets from the automobile has been building momentum since it launched in Toledo, Spain 16 years ago. Austria: Seven cities will compete to see which type of transportation – bike, mass transit, car, bus – is fastest in each city. Shanghai, China: In an improvement from last year, seven square blocks around the Shanghai World Expo will be closed to car traffic. Chicago, U.S.A: Events include bike rodeos, rallies and a meeting of bikers who have been hit while bicycling. And World Streets, in addition to carrying a thorough history of the event, is offering some inspiration for those who are trying to make a difference in a car-dominated environment. Rarely are there single persons or groups who all by themselves make the difference. Rather there is this slow, often irritatingly slow, cumulative process of assimilation of ideas, attempted actions, not all of which crowned by immediate success, and changing perceptions which occasionally combine, here and there, to change first attitudes and then, with any luck at all, some of the salient and important choices that we all make together which shape our daily lives, and those of our cities. The most basic action a person can take is to simply see what it’s like to live without a car. 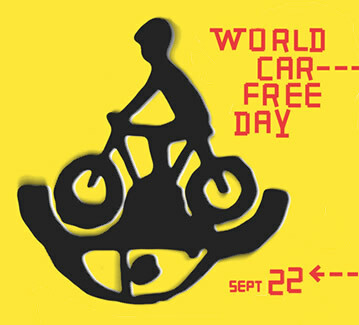 Do you know anyone who’s foregoing driving to celebrate World Car Free Day? Also on the Network today: Livin in the Bike Lane laments the death of Green Party Senate candidate Natasha Pettigrew, killed by an SUV driver early Tuesday. Urban STL reports on the design competition winner for the Gateway Arch grounds, which includes building a “lid” over parts of Interstate 70 to improve pedestrian access between downtown and the landmark. And Walk and Bike Berks County directs readers toward a Rails to Trails Conservancy petition which takes on officials at AAA for suggesting funding cuts to biking and walking infrastructure. Ok, I’m sorry, but you can’t “reclaim” something that was never “yours” to begin with. Modern streets were never designed for bicycle use. It’s one thing to say let’s redesign how cities work with bicycles in mind (which I’m all for) but to suggest they were somehow stolen from bicyclists is just stupid and hurts the cause. Johnny, I don’t own an automobile. Just as a reminder, modern (which is what I said in my initial comment) is defined as “of or relating to the present or recent times as opposed to the remote past”. That includes, modern speed limits, modern traffic rules, etc. and has nothing to do with origins of pavement. But please, do continue to be an ambassador for bicycling with this sort of approach to discussion and see how many people you win over that way. AAA is and always has been in favor of a safe, efficient, multi-modal transportation system. For more information on AAA’s efforts in this regard, see http://www.AAAmakingamericastronger.com. Thank you.